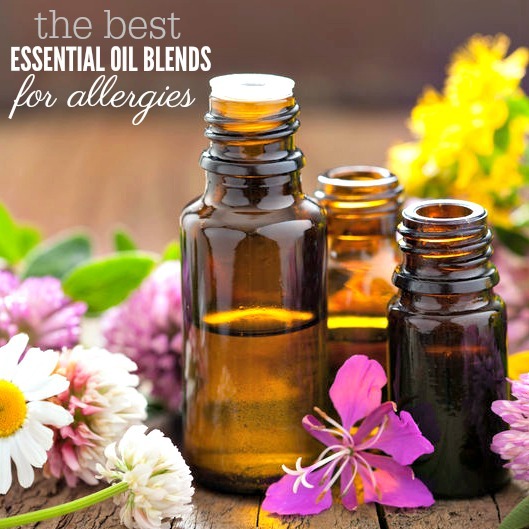 Today I wanted to show you some of my favorite essential oil blends for allergies. Allergies are no walk in the park and we have the Best Essential Oils for Allergies. Try these 6 essential oils for allergies to help you endure allergy season. I don’t know about you but my allergies can be terrible at times. Between the watery, itchy red eyes to the sneezing, runny nose, and general grogginess, allergies can make you feel sick and drained by the end of the day. Some times of the year are better than others but they are definitely worse when everything starts blooming. My allergies go crazy! What is the best natural remedy for allergies? Essential oils have lots of therapeutic benefits and can help with many of the symptoms that comes with allergies. If you suffer from allergies, check out these essential oil blends for allergies to help with some of the allergy symptoms. We are a big fan of essential oils around here and you can learn even more about How to use Essential Oils. There are so many great ideas. From the Best Essential Oils for Relaxation and The Best Essential Oils for Hair Growth to 25 Lavender Essential Oil Uses, there are lots of useful ways to use essential oils. 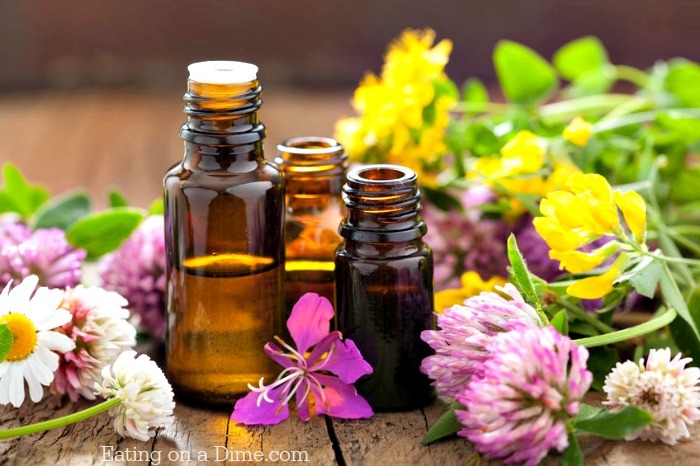 Let’s get started with the essential oils for allergies! Whether you are looking to reduce inflammation, clear nasal passages or improve respiratory conditions, there are essential oil blends for you. Allergic rhinitis often can cause watery eyes, runny nose, sore throat and more. Try some of these essential oils with anti inflammatory properties and more. You will love these blends for allergies using essential oils. From peppermint and lavender to lemon and more, there are several options. Keep reading to see all of the best essential oils for allergies. Is Tea Tree Oil Good for allergies? Yes! Tea tree oil is great for allergies. This oil is used in one of the blends below for sinus congestion. Try this basic recipe for essential oils for allergy relief. Place these in a diffuser to help with your allergies. I also just love the scent of lemon essential oil. Putting a drop of lemon oils reduces seasonal allergies and smells so fresh. Mix these together in a diffuser and it is great with those allergy symptoms. There are so many great options for diffusers. You can see lots of different options here. Get rid of those itchy eyes caused from allergies and other symptoms with this oil blend. This is a great blend for essential oils for sinus congestion. Combine them in your favorite essential oils diffuser. It can be hard to control sneezing when triggered by allergies. Use this blend of essential oils to get sneezing under control. Diffuse this in your favorite diffuser to help with congestion. This is my all time favorite essential oil blend for allergies. It is amazing what a few drops of eucalyptus can do. We love our diffuser and have several. You can even get an extra for your office. There are so many great options for diffusers. You can see lots of different options here. Which one of these essential oils for allergies and asthma do you plan to try? There are so many great ones! As always, be mindful of skin irritation and allergic reaction to oils include applied topically to skin. 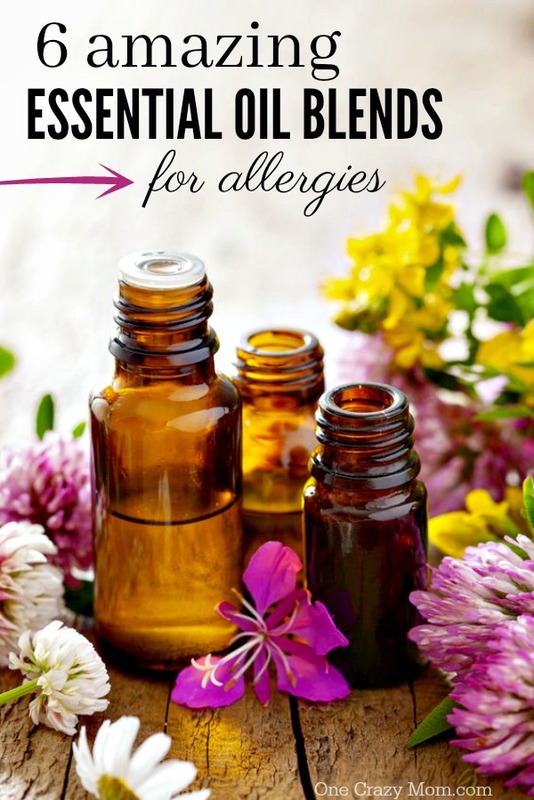 We love using essential oils for allergies! It is nice having so many natural options to give my family. You are going to love having so many natural products to grab in your cabinet with these essential oil remedies for allergies! The entire family will benefit from these essential oils and everyone will be able to endure allergy season. Your budget will also benefit as well! I also love the peace of mind of knowing exactly what I am using and giving to my family with these essential oil blends. It feels so good to have these natural products on hand to give your family. When we first started trying to incorporate more natural products into our lives, I only bought a few essential oils. I just did what time and budget allowed. Feel free to try a blend and then you can buy a few more later and try something new if you would like. No need to get overwhelmed and try do it all at once. Essential oils for allergies helps our family stay on track with using natural products! Before long, I had a long list of natural products we were using. Now, I can have natural products at home for a fraction of the cost! I know my family is using really good products and that makes me feel good as a Mom! Life is so busy but these natural ideas really do take very little time to make. I think you will be pleasantly surprised how quick and easy it is to make your own essential oil blends at home. There are so many options and ideas to try for your family. As a mom, I feel so much better trying something natural and not loaded with lots of extra stuff. Give some of these ideas a try and let us know what you think. Learn how to make homemade bath salts that are luxurious and will leave your skin so soft and smooth. Are you tired and achy? Try this DIY Sore Muscle Cream. Not only does it feel amazing on tired and sore muscles, it smells so good and works great. Give this All Natural Cocoa Butter Lip Balm recipe a try and it will quickly become your go to recipe! It is simple and inexpensive to make while keeping your lips moisturized all year long.